This unique 55m ice class expedition yacht is now listed for sale with Burgess. 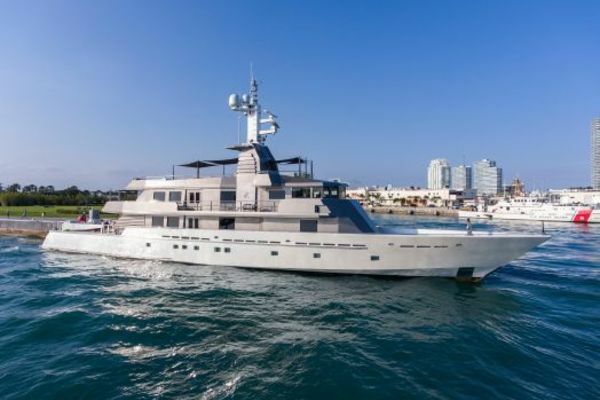 Launched in early 2009, STEELremains one ofPendennis' largest volume custom new builds to date. Her elegant interior styling and robust exterior lines are the result of a collaboration between the yacht owner, Pendennis and interior / exterior yacht designers Liebowitz & Pritchard Architecture + Yacht Design. STEEL's interior features Cuban mahogany wood and beautiful Dutch marble bathrooms. The main saloon, with its fully equipped gentlemen’s bar, can also be transformed into a cinema room. The dining area has high ceilings and an opulent chandelier, and the upper deck has a further dining room with pantry. Accommodation comprises of master cabin mid-ship on the Main Deck, a double guest cabin with an additional pullman berth on the Boat Deck and four twin cabins on the Lower Deck, each with pullman berths. There is a further Nanny/ children’s cabin with additional pullman berth on the Lower Deck (which could be used for staff or guests dependent on owner's requirements). Exterior features include imposing high prow, functional 'work deck' forward (jet ski storage), multiple sundecks, active-current spa pool and sculptural rounded stern which effectively aids ship stability in following seas. United Yacht Sales New Jersey would love to guide you through a personal showing of this 177' Pendennis Shipyard 2009. This yacht for sale is located in Unknown Finland and priced at $27,500,000. For a showing please contact us by filling out the form on this page and we will get back to you shortly! Currently in Falmouth, in the Pendennis shipyard completing works. Contact Burgess for more information on viewing availability. The Company offers the details of this vessel in good faith but cannot guarantee or warrant the accuracy of this information nor warrant the condition of the vessel. A buyer should instruct his agents, or his surveyors, to investigate such details as the buyer desires validated. This vessel is offered subject to prior sale, price change, or withdrawal without notice.